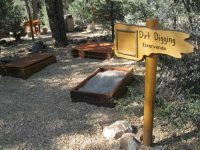 One of the visions of Big Bear Discovery Center is of being a gateway for adventure and discovery in the great outdoors. 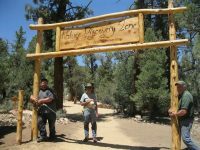 The center is one of six programs of the National Forest Association addressing the three initiatives of conservation, environmental education and responsible recreation on public lands. 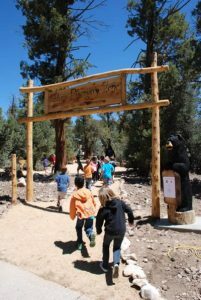 The Big Bear Discovery Center is one of the busiest national forest visitor centers in the nation, reaching approximately 250,000 visitors annually. There is a large need for programs that focus on young children as the visitor center reaches primarily families and young children. Many visitors come from surrounding urban communities and are just beginning to interact with nature. 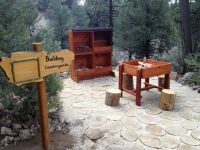 The addition of a Nature Explore classroom is helping the Center to focus on health, sustainability and stewardship while re-connecting visitors to nature and enhancing their experience in the outdoors. 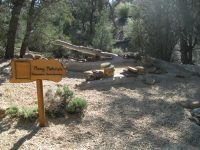 This beautiful space, which was named The Nature Discovery Zone, was designed around existing trees, native shrubs, underbrush and natural features. 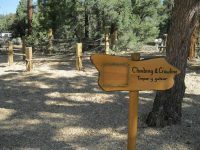 The trees have been trimmed up to approximately four feet to create better visual lines throughout the site. 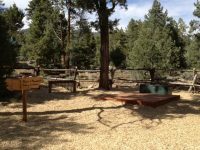 Personalized with local materials, most of the structures for the classroom were sourced from the San Bernardino National Forest. The log of interest, in the Messy Materials Area, was taken out of a fire burned area near the Discovery Center. 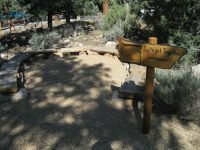 Local elementary school children and youth volunteers personalized the pathways by designing all of the paver stones. 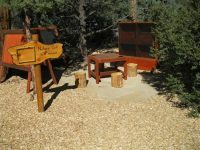 A local woodworking artist was chosen to create all the signs and the bear carvings for the entryway. These simple signs, designed to fit the overall theme of the Discovery Center, help guide children and parents throughout the space. Additional photos of children using the space were added as visual clues. An Open House was held on May 24th with sixty students from local elementary schools participating along with many families and local officials. Training of volunteers and recruiting parent volunteers is always ongoing and serves as a way to build a sense of community at the Center. 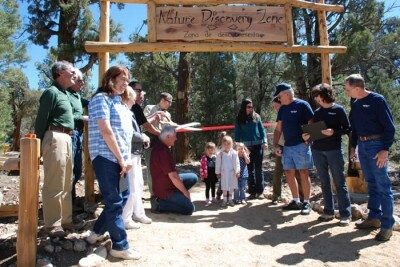 A wall display in the Discovery Center will highlight the benefits of connecting children with nature at the Nature Discovery Zone.